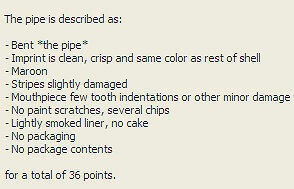 The value of pipe #715 is 36 points. Marle Smith (beadyeyes) offered this pipe on eBay.This one is nice but, as it turned out, no improvement over the exemplar I have; so it goes to the Pipes for Sale page. Larry Buys wanted it for his collection.